Sorting permutations by operations such as reversals and block-moves has received much interest because of its applications in the study of genome rearrangements and in the design of interconnection networks. A short block-move is an operation on a permutation that moves an element at most two positions away from its original position. This paper investigates the problem of finding a minimum-length sorting sequence of short block-moves for a given permutation. A 4/3 -approximation algorithm for this problem is presented. Woven double-strip permutations are defined and a polynomial-time algorithm for this class of permutations is devised that employs graph matching techniques. 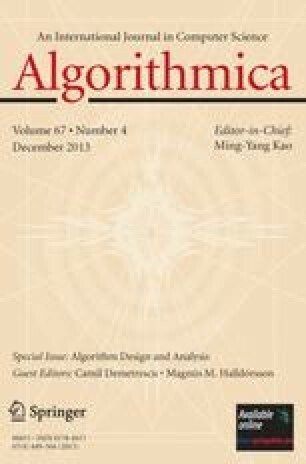 A linear-time maximum matching algorithm for a special class of grid graphs improves the time complexity of the algorithm for woven double-strip permutations. Key words. Computational biology, Genome rearrangement, Approximation algorithms, Maximum matching, Permutations. Received June 1, 1997; revised July 25, 1998.